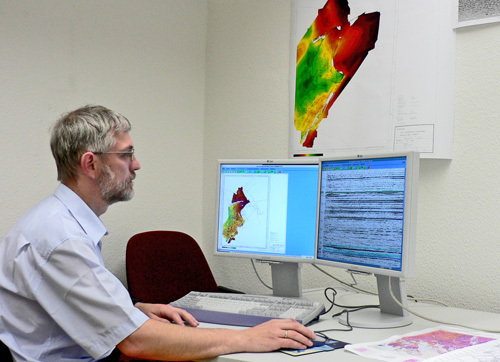 Subsequent to processing we offer the integrated geological interpretation of all geophysical information and supplemental data. Every employee of our team gained field experience as well as profound knowledge with regard to analysing and processing of geophysical data. We consider this widespread expertise of our staff a valuable advantage when it comes to the assessement and interpretation of the recorded data and our ambition to deliver results of constant high quality. Apart from personal knowledge and long-term experience we higly appreciate detailed information regarding the investigation area such as provided by our clients to achieve the best possible exploration results. This information includes borehole data as well as available information regarding topography and recent plant coverage, regional- and local near-surface geology, ground water level, etc.